Bundesliga | Replacing the irreplaceable: who will fill Julian Weigl's boots for Dortmund's "two finals"? Replacing the irreplaceable: who will fill Julian Weigl's boots for Dortmund's "two finals"? There were few reasons for cheer for Borussia Dortmund following Matchday 33's 1-1 draw at Augsburg. Although still third, Thomas Tuchel's side missed the chance to take two precious points in the race for automatic UEFA Champions League qualification, allowing Hoffenheim (who beat Werder Bremen 5-3) to cut the gap. How did your Official Fantasy Bundesliga team fare on Matchday 33? Further reason for the deflated mood in the Dortmund camp at the WWK ARENA was the broken ankle suffered by midfield metronome Julian Weigl. The injury will keep the 21-year-old out for three to four months, meaning he will miss BVB's final two games of the season, "two finals" according to Tuchel, against Werder Bremen in the Bundesliga and then against Eintracht Frankfurt in the DFB Cup final in Berlin. "Julian Weigl is a massive loss for us," said Tuchel. "We can't really replace him directly. We have two finals now, though, one in Dortmund and one in Berlin. I'm looking forward to these two finals; I'm totally focussed on them and nothing else until the end of the season." "I'm going to do exactly what it says on my tattoo: stay positive! Thanks for all your messages - I'll give it my all to come back as quickly as possible." How Tuchel plots to replace Weigl in midfield will go a long way to determining how his side fares in the upcoming tests: the Germany international is the fulcrum of the current Dortmund team, completing a remarkable 89.3 per cent of his passes this season and winning over 60 per cent of his individual duels. Weigl is one of those rare deep-lying creative midfielders – in the Xabi Alonso mode – who marries defensive awareness with an understated creativity; a combination that provides BVB's high-profile attacking stars the platform on which to shine. His deeper position in front of the back four in a 4-2-3-1, usually alongside a more combative midfielder is, as Tuchel pointed out, unique and irreplaceable. While Sahin would come as close as possible to replacing the irreplaceable, another option for Tuchel would be to play a more combative duo in holding midfield: Weigl is usually paired with one of Gonzalo Castro or Raphael Guerreiro, their role to add the steel to Weigl's silk. Pairing Castro and Guerreiro together would offer a hard-running alternative and, where Weigl's pinpoint passing usually feeds the midfield, one or both would likely be instructed to carry the ball in order to link midfield and attack. Guerreiro in particular has thrived this season, whether deeper or further forward, prompting Tuchel to say that he is "too good to be limited to one position". "We need to beat Bremen," said Marcel Schmelzer. "We don't want to be in the play-offs. We want automatic qualification and then we want to bring the Cup back to Dortmund." Whatever happens against Bremen, the pressure will be ramped up another notch the following week for the DFB Cup final against Frankfurt, Die Schwarzgelben's fourth domestic Cup final in as many years, although the previous three have ended in heartbreak for those of a Dortmund persuasion. 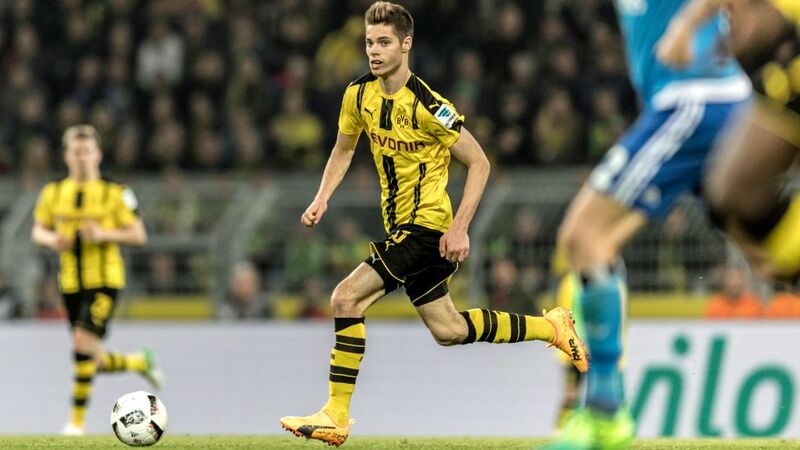 The prospect of finally lifting a trophy after five long, barren years is motivation enough, but for Weigl a first major trophy would be particularly sweet and would doubtless go some way to easing the long road to recovery. Come late May, then, and Dortmund could suddenly have several reasons for cheer. Click below to vote for Julian Weigl to be part of your Bundesliga Team of the Season!